L C R Panning and Mixing In Mono? True LCR panning is very prevalent in genres that have hugely dense mixes, particularly songs with massive guitar and synth sounds. Mixing Acoustic tracks, Orchestral and Jazz recordings would rarely if ever employ this technique. Every great mixer uses some level of LCR, few if any only use it. However understanding the basic concepts will be great to add to your mixing arsenal! 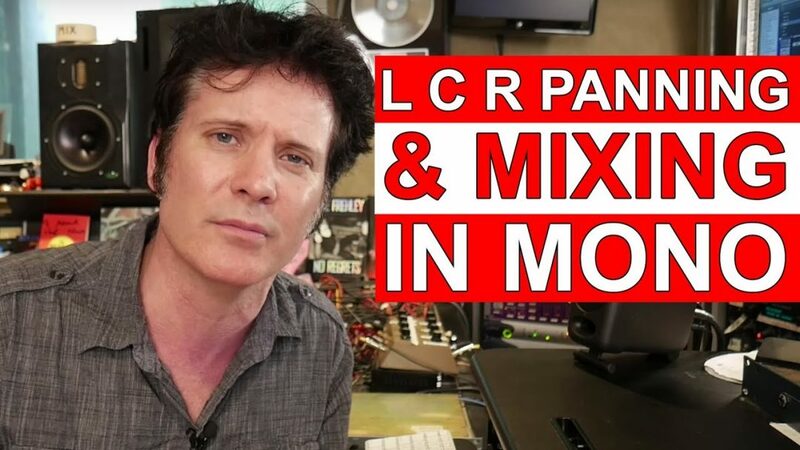 LCR panning is a very easy way to create width and space in your mix and following these basic tips will speed up your mixing process considerably! • Using LCR means there are only three main areas of the stereo field you have to think about (Left speaker, right speaker, and the centre). • Pan the lead vocals, the kick, the snare, and the bass to the centre. • Pan dominant instruments that occupy large amounts of the mid range frequencies all the way to the left and to the right (Such as Heavy Guitars and/or Synths). • Of course these ‘rules’ can be broken at any time… switch anything around and choose what works best for you. The basic principal with LCR panning is the limitations of only choosing Left Centre or Right will not only create space and width, but by removing and simplifying the choices you will speed up your mix process considerably. • Remember in LCR to try automation panning for extra creativity! High line percussive parts sound great flying from one speaker to another! Most Mixers don’t mix in Mono, but they do very often check in Mono. However they are typically mixing in environments they are familiar with and using equipment they are familiar with, so they are not checking Phase/Polarity issues continuously. They also have a great understanding of what EQ points work to help support the sides and the centre. • Low end comes across as Omni/Multi Directional or Mono sounding. Meaning Extreme lows such as the Kick Drum, Bass guitar or Bass synth will always work best in Mono, Panned to the Centre. • Guitars with Multiple Mics and Multiple overdubs can easily have phase/polarity issues so be careful to high pass them so as not to have an undefined muddiness in their low end. Typically a gentle high pass around 80-150 Hz will work great! Checking them all together in Mono will instantly reveal any Low End phase/polarity cancellation. • Mixing your track in Mono for balances can work however bear in mind that the high mids of guitars panned mono might effect how bright you make the snare drum and you may find yourself removing seemingly excessive high mids from the guitars only to find the guitars sounding to dull when hard panned. • The moral is Mono is a HUGE tool! Use it frequently to check your mix! I often think about recently working with David Foster on a Diane Warren song and he talked about walking around a Mall and also going in and out of Stores and what do you hear? Predominantly you hear Vocals and Drums, it goes to show that in any mix the centre, the area unaffected by stereo imaging is THE most important part of our mix! Most professional mixers have a great understanding of what EQ points work to help support the sides and the centre. Want to learn more about mixing with EQ & Compression? In the following course, Grammy winning engineer Phil Allen gives you a deep understanding of the most important mixing tools, so you can effectively apply them in mixes. Have a marvellous time mixing! The song featured in this video is ‘My Final Hour’ by Snakebite. You can mix this song yourself if you get the Mixing Rock with Ulrich Wild course.